Made from sheep or goat's milk and packaged in brine, feta cheese adds a distinctive salty bite when crumbled over salads or added to omelettes. Feta cheese can be used in cooking, or offered as a selection on a cheese plate. 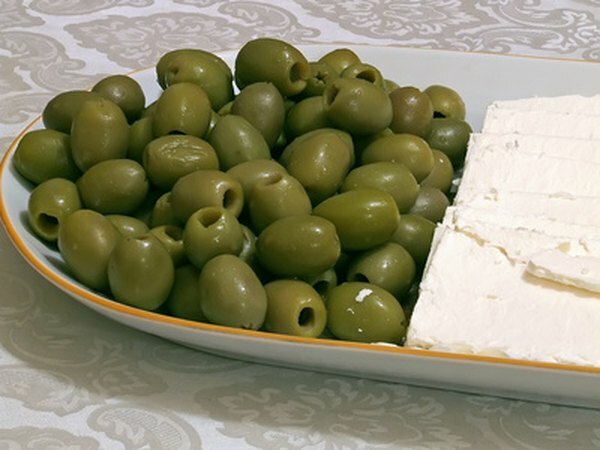 This Greek cheese is arguably healthier to eat than many other cheeses because it is significantly lower in fat. With 75 calories and 6.03 grams of fat, 1 ounce of feta cheese is the lower calorie and lower fat option when compared to cheddar, which has 114 calories and 9.4 grams of fat. The occasional addition of feta to dishes should not derail your efforts in maintaining a healthy weight. Feta has 4.03 grams of protein per ounce, which is less protein than other cheeses such as cheddar and Colby, which have 7.06 and 6.74 grams of protein, respectively. This comparison notwithstanding, feta still has a significant amount of protein. One ounce of feta cheese supplies 8 percent of the daily value for adults on a 2,000-calorie diet. Protein is essential to support life because enzymes, antibodies and some hormones are all made from protein. One ounce of feta supplies a substantial amount of some B vitamins and calcium. The recommended daily allowance for riboflavin is 1.3 milligrams for adult men and slightly less for women. With 0.24 milligrams riboflavin, a 1-ounce serving supplies 18 percent of the RDA. The RDA for calcium for adults between 19 and 50 is 1,000 milligrams. With 140 milligrams of calcium, a 1-ounce serving supplies 14 percent of the required calcium. B vitamins help metabolize food and make red blood cells. Calcium helps prevent loss of bone density. With 260 milligrams of sodium, 1 ounce of feta has substantially more sodium than other cheeses. For example, 1 ounce of cheddar has only 176 milligrams of sodium. While feta is a healthy food in many respects, the high sodium content suggests that it should be eaten sparingly because this increases blood pressure. The American Heart Association recommends that people limit their sodium intake to 1,500 milligrams per day. Soaking feta in milk or water before serving it will lower the sodium content.